Kaltxi! Allow me to introduce our newest featured fan, Karina, who hails from Semey, Kazakhstan. One of the first things you’ll notice about Karina is her hair, she explained to me that all of her interests are display in her appearance because she always changes her hair color. A fun fact, Avatar first released in theaters on her 11th birthday, and having just turned 20 she has truly grown up with the franchise. Karina has finished medical college because she is going to work as a tattoo master, and to do so she first had to have the medical education. She is a self taught artist, drawing since she was a child, knitting, beading, among many other talents. She also loves to dance and is currently a hip hop dancer, and apart from art and dance is a fan of estoterics, and psychology. 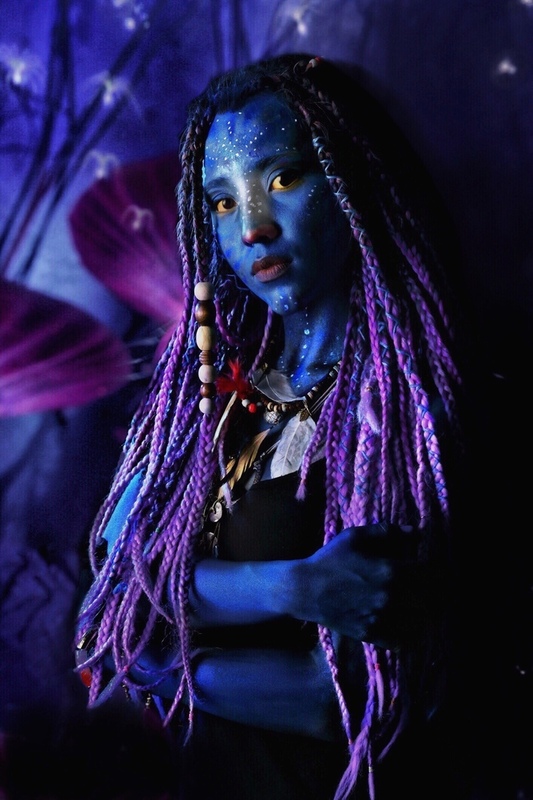 Having been drawn to Avatar since she first saw it as an 11 year old she felt a connection to the Na’vi. Some of her favorite things about them was their beauty, strength, and grace. She also liked the way they live in harmony with animals, nature, each other, and Pandora. She feels Pandora is the most amazing place and is it’s own art form. Her favorite parts of Pandora are the flora, fauna, Eywa, and the glowing bioluminescence that comes out everywhere at night. Something that was important for Karina to express was for us to all remember that even though the film shows many humans vices. We should still remember our ability to sympathize with our neighbor by showing kindness, strength, love, and courage. We should never lose our humanity. 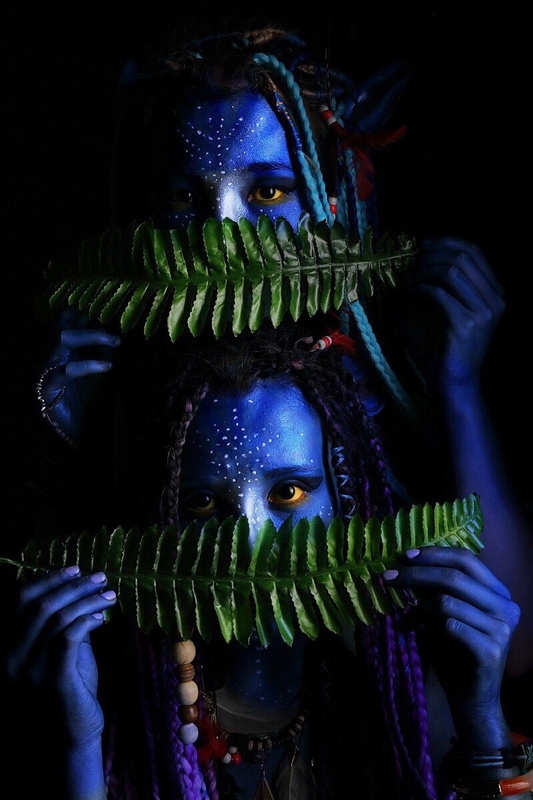 This past summer she did an Avatar photo shoot with her friend. 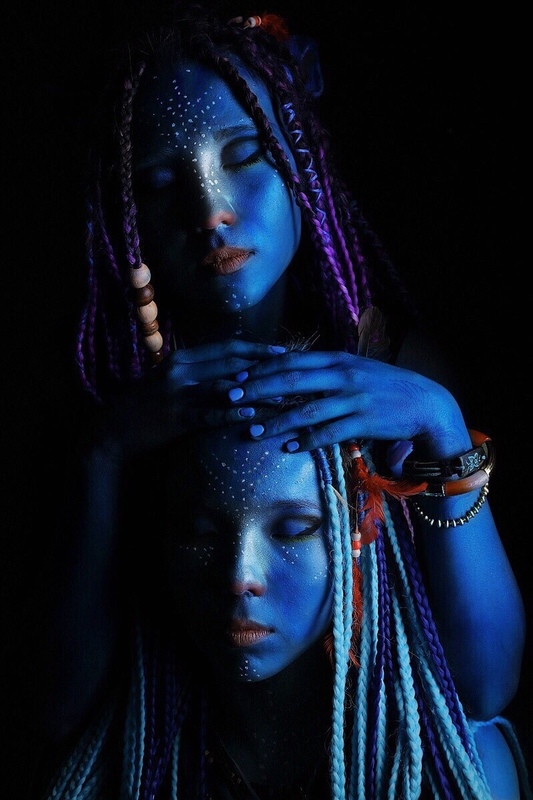 Karina painted herself and her friend over 3 hours, and even made the jewelry and ears. 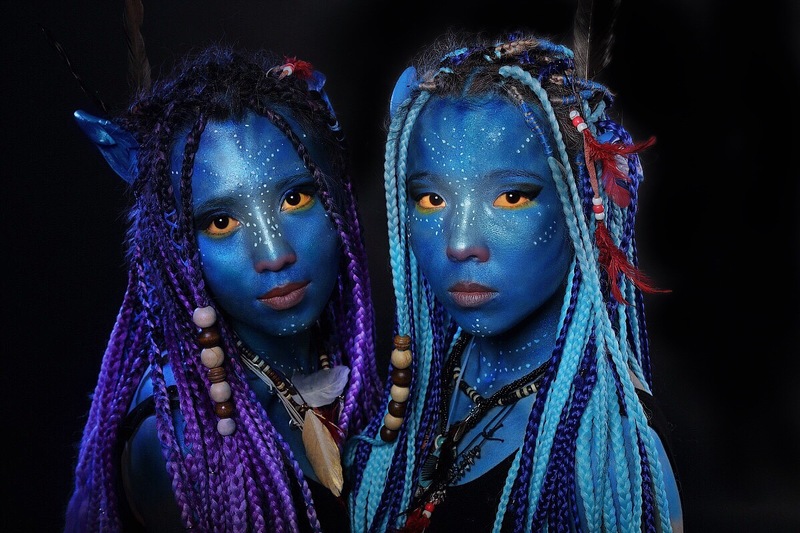 While walking from the house to the car several children saw them and shouted “Avatar!.” While doing the photo shoot the Avatar soundtrack was playing, helping Karina and her friend get into their role as Na’vi. She said the atmosphere in the studio had such amazing atmosphere. It was an unforgettable experience for her and she hopes to do it again one day. 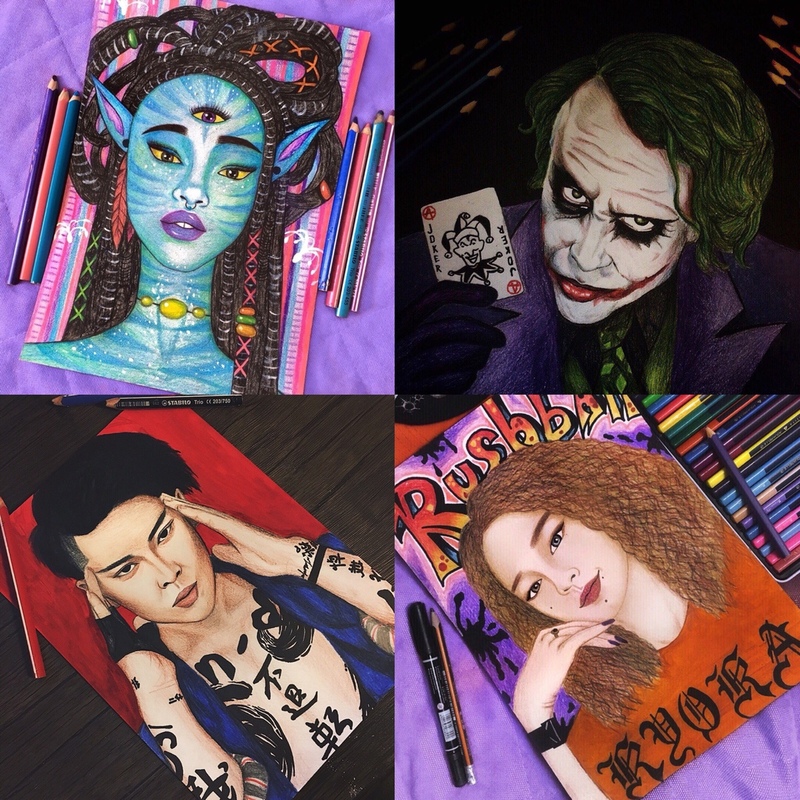 So here is a sample of her incredible artwork, and some of the amazing photos from that shoot. 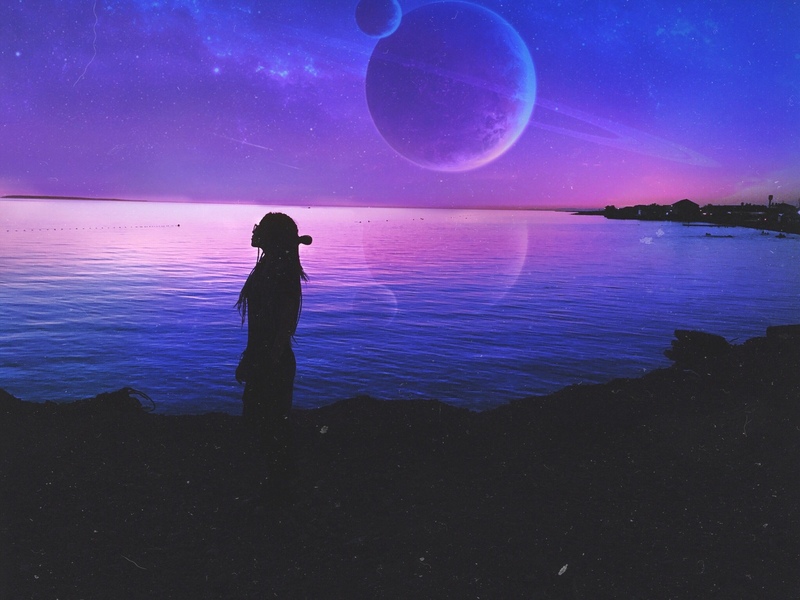 I first came across Karina on Instagram after another Avatar fan linked me to her profile, thanks Ryan, I reached out to her and was able to exchange emails and bring this spotlight to life. It’s so cool knowing people love Avatar across the world. It brought a huge smile to my face hearing about the children cheering Avatar when you were in full cosplay. I just want to say thank you to Karina for participating and for her patience while I brought this article to fruition. If you’d like to follow her for yourself please check her out on her Instagram. When this website was created I had a couple goals in mind, to give back to the Avatar community by sharing news and a positive message. Also by giving back to the community specifically via fan interaction, there are some really great fans out there. So this is the first of hopefully many interviews spotlighting an Avatar fan. You don’t have to own merchandise, you don’t have to speak fluent na’vi, you just have a positive attitude and a passion for Avatar. If you’d like to nominate anyone for Fan Spotlight please press the contact tab and send us an email. Irayo! Hello Victoria! First I’d like to say thank you for being the first AvatarSequels.com interview. No problem!! I love the site so much and I’ve learned so much about the franchise by the site itself! So starting from the beginning, how did you discover Avatar, and what sucked you in? Well, when Avatar first came out in ‘09, I was fairly young at the time; 3rd grade to be exact. I remember everyone in my class talking about this AMAZING film that just came out called Avatar, and all the cool kids in the class got see the film. Me being in 3rd grade at the time, my family didn’t let me see it in theaters so I sadly had to wait until it was released on DVD. When I finally saw the film, my mind was BLOWN!! I was mesmerized by all the colors, the creatures, the beautiful effects, etc. I had never seen such an amazingly beautiful film in my entire life- Even years later, I still obsess over the film and am equally mesmerized by its beauty! So I take it you haven’t had the chance to see Avatar in theaters yet, what about in 3D? I luckily, finally saw Avatar in 3D just last year!! My mother got a hold of a 3D television and I saved up my money to buy Avatar in 3D Blu-ray. I was mesmerized! Again!! It felt like I was watching the film for the first time! I picked up so many different details that I hadn’t noticed the other times I watched the film; Even my family was astonished by its 3D effects! What is some of your favorite characters, animals, and scenes that stuck with you from the film? As a young child, I was mesmerized by the Na’vi designs. I loved how they looked human, but also alien, yet somehow had a beauty to them which we don’t normally see in films that deal with aliens/Extra Terrestrial beings. I was also mesmerized by the thanator and banshees; I just loved the idea of being able to ride one of those! Speaking of riding a banshee, have you had the chance to visit Pandora The World of Avatar? Yes!! I was very lucky to go with my family last year! I’m very lucky to have a family that loves Avatar as well, so they were excited to go too! When we got there, we immediately got in line for Flight of Passage and waited 2.5 hours! My family and I both agreed that it was very worth the wait! I loved Pandora so much! I also catch myself wanting to go back from time to time, wishing I lived closer to Disney. I plan to go back soon, maybe next summer. I just need to experience Pandora again! What were some of your favorite parts of the park? I loved the rides (Of course! ), especially Flight of Passage. After watching Avatar when I was younger, I always wanted to experience flying on the back of a banshee, and Pandora finally gave me that opportunity!! I was brought to happy tears after the ride; it’s just so beautiful and realistic; it truly made me think I was in Pandora for those 4 minutes. I also really enjoyed how amazing the wildlife looked!! Pandora looked so real with it’s floating mountains, vibrant plants, and the canyon where Flight of Passage resides; the canyon just blew me away!! I still am in awe about how the imagineers made Pandora look so real and vibrant. Did you get a chance to see the Cirque du Soleil show Toruk – The First Flight? Yes!! I was lucky to see that show as well! My dad and I traveled 2.5 hours to see the show and it was very well worth it! It’s amazing how the actors and actresses can contort and twist their bodies in such odd ways. I also loved how the entire show was spoken in Na’vi and then translated into English by an Elder Na’vi; that was a great touch to make it all seem 100% more authentic. Did you get a chance to pick up the Dark Horse Avatar comic last year? I did!! I waited in line on Free Comic Book Day and got myself a copy!! I loved the art style and how it dives more into detail about Jake’s story. I just wish the comic was longer! I’m itching for more! Even though we are still 2 years away from Avatar 2, is there anything you want to see in the first sequel? I’ve always wanted to see more creatures and animals of Pandora. 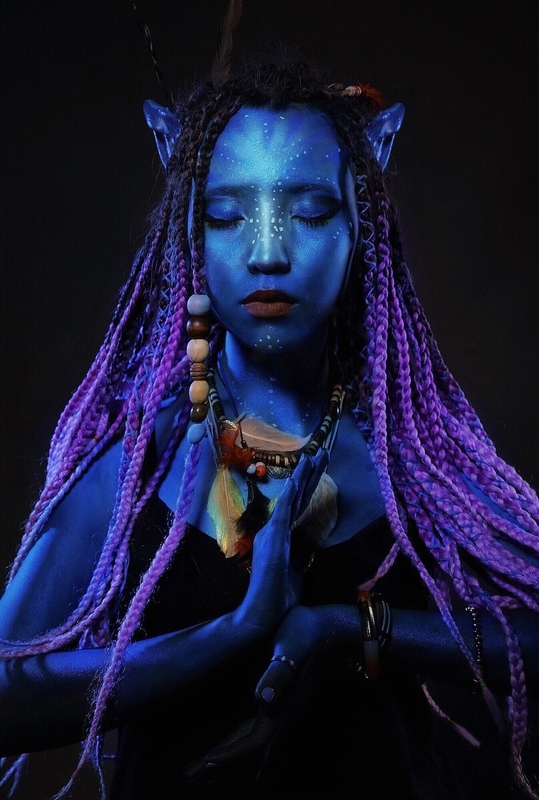 I also really wanna see more Na’vi tribes and female Na’vi warriors; Neytiri was the highlight of the first film for me, so I also hope to see more of her! She’s an amazing character! We are over 8 years removed from the release of Avatar and you have essentially grown up with Avatar. So how do you celebrate your Avatar fandom and keep that fire burning still today? I keep in touch with many other Avatar fans through forums, especially the Learn Na’vi forum. I also have given myself a goal to try and learn some Na’vi before the sequels, so maybe I won’t have to use subtitles when Na’vi is spoken! I also have tried to keep up with the news about the sequels to get me excited and stay up to date- Avatar has a very special place in my heart, so it’s hard to fathom me ever out-growing and getting bored of it. Thank you so much for your support for the site and again, a huge irayo for being our first interview. Irayo níxtan for interviewing me!! It’s an honor that you think of me first for the interview on the site!